The following tutorial demonstrates the capability of ReconOS to create hardware slots which can be reconfigured at runtime. 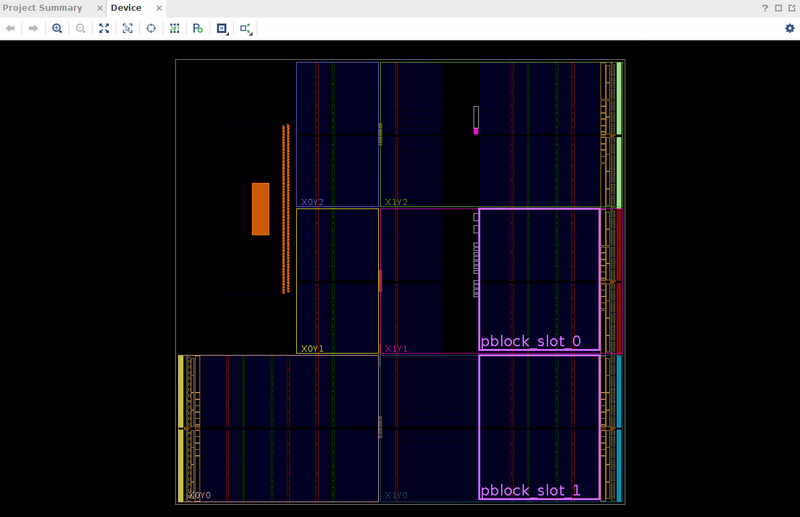 As ReconOS v4 supports the use of Xilinx’s Vivado Design Suite, we will use the partial reconfiguration feature of the latter to create reconfigurable hardware slots and partial bitfiles for each hardware thread (HWT). The demo application used in this tutorial will run the sort demo with up to two hardware threads and then reconfigure the slots to instantiate hardware threads executing the matrix multiplication demo. The tutorial on partial reconfiguration and the Tcl scripts are taken from the Xilinx Application Note 1231 and adapted to Vivado 2017.1 . All demo files are available in the ReconOS repository. This creates three threads. The first thread Reconf is the only specified hardware thread and acts as a placeholder since the associated hardware slots will later be marked as blackboxes and filled with the functionality of the sortdemo and matrix multiplication during partial reconfiguration. The other two threads are software-only threads. The ReconOS build script will thus create three important C-functions for thread creation: One for the delegate threads of the reconfigurable hardware slot, one for sortdemo software threads and one for matrixmul software threads. 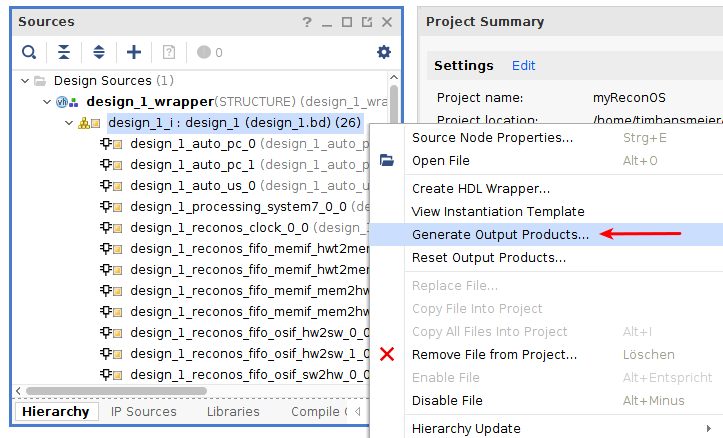 Start the Vivado IDE and open the generated Vivado project, located at build.hw/myReconOS.xpr. Now generate the output products by right-clicking on the design_1_i block diagram. In the following dialog, choose global synthesis as we need to modify the sources before synthesis. Save the changes to the constraints by clicking the save icon in the upper left corner of Vivado. In the following dialog, leave everything unchanged and set the filename of the new constraint file to design_1_pblocks. You can now close the synthesized design and re-run synthesis to bring the synthesized design up-to-date. After synthesis is finished, close the Vivado IDE. The project-based flow of the Vivado IDE does not support partial reconfiguration for block design modules, hence we have to switch to a non-project Tcl-based approach to generate the bitfiles. Xilinx provides a Tcl script which was modified to fit to the demo files. Before executing the script, the black box attribute of the two hardware slots needs to be removed, because they are now filled with the actual hardware threads. We do this by commenting out both attributes. As the demo starts with the sortdemo and then uses partial reconfiguration to switch to matrix multiplication HWTs, the demo only needs the full sortdemo configuration and the partial bitfiles of the matrix multiplication. Create a delegate thread for each reconfigurable hardware slot using the function reconos_create_hwt_reconf(). The FPGA is initizalized with the sortdemo configuration, so this will create sortdemo hardware threads. Stop the hardware threads by calling reconos_thread_suspend_block() on the hardware slot which should be reconfigured. In order for this to work properly, the currently running HWT must exit only when HWT_signal is set. For more details, see the demo’s vhdl sources of the threads. Additonally, all threads must rely on mbox_tryget() calls instead of uninterruptible mbox_get() calls. For a detailed understanding of the flow, it is inevitable to study the main.c file of this demo. In the demo project folder, compile the software by using the ReconOS development kit (see the commands below). The executable can then be found at build.sw/reconfsortmatrix. Create a folder for the demo in the nfs share and copy the executable reconfsortmatrix, the bitfile config_sortdemo.bit and the two partial bitfiles config_matrixmul_pblock_slot_0_partial.bit and config_matrixmul_pblock_slot_1_partial.bit into the folder. Connect to the UART of the Zedboard, e.g. with picocom, boot linux and navigate to the just created folder. Before we can run a ReconOS program, we need to load the ReconOS kernel module. Loading the kernel module requires a configured FPGA. Hence, program the FPGA with the config_sortdemo.bit bitfile and then execute the reconos_init script. Upon initialization, the kernel module determines the number of hardware slots of the currently loaded bitfile, so it is highly recommended not to load an arbitrary bitfile into the FPGA, but instead one of the bitfiles from this demo. If the run was successful, the demo outputs several timing measurements before termination. This concludes our demo on dynamic reconfiguration of hardware threads. Have fun adapting these concepts to your own applications!